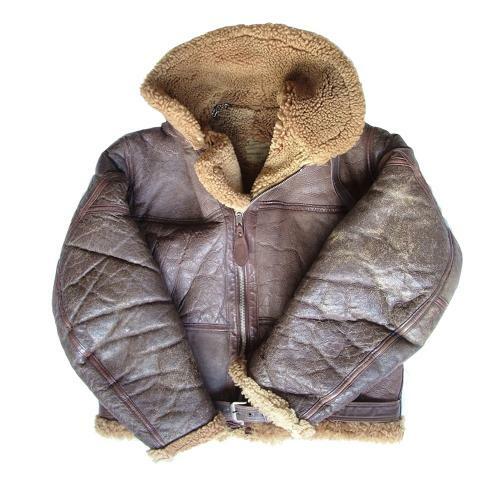 'Thermally Insulated Flying Suit, Jacket'. Stores reference 22c/320. Size 4 (Ht. 5'8 - 5'9", Br. 36 - 38", Wt. 32 - 34"). Physically measures 44" (pit to pit) so should be suitable for around a 38-39" chest. This example is of mid to later war configuration with mulitple panel construction. The leather is in good '+" to very good overall condition retaining much of the original chromed finish and flexibility. There is some wear, abrasion and loss of chroming in places - most notable on the sleeves and upper back but nothing serious and all the seams appear to be good and tight. Excellent short dense fur lining and collar facing. Both cuffs and waist retain good fur. All zips are original, the main is a 'Lightning' c/w leather puller. The right cuff retains the slider and works fine but has no puller tag. The left cuff has no slider at all but the zip tape and teeth appear undamaged. The belt is complete and in good condition. Also has the original chain hanger (detached at one side), collar strap / rings and label. Whilst the appearance and finish would benefit from some leather dressing this is a very good '+' used example. Further photographs available on request. Approximate measurements : pit to pit 22", pit to cuff 21", Collar seam to waist 22". All taken with jacket laid flat and zipped.